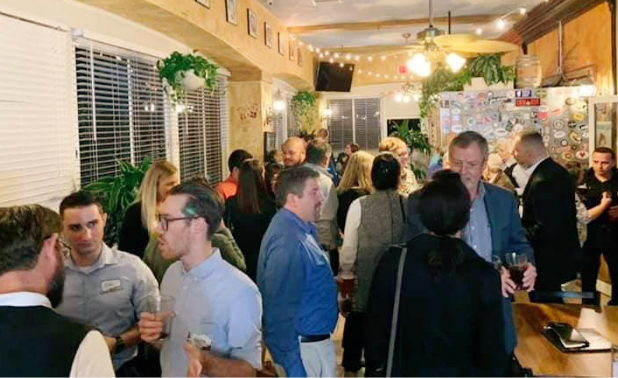 For the first time in its storied history, we held Entrepreneur Night in Port Orange. Over seven years, with over 60 events and 10,000 attendees, Entrepreneur Night has hosted events from Jacksonville to DeLand. However, there’d never been an event in Port Orange—a fact the planners at Office Divvy were more than happy to change. We did so in partnership with an amazing venue known both for amazing craft beer and delicious food offerings: Tomoka Brewing Company. Over 100 people came out for the event, which was documented by Volchek of Virtual Open House. Enjoy these short moments from the event and let them inspire you to come out to the next Entrepreneur Night! DJ Vern of Pyramid Disc Jockeys served as Master of Ceremonies for the event. Michael Schottey of Office Divvy made the announcements. The rest of the Office Divvy team ran the hospitality table, greeted guests and made sure everyone continued to have a great time. The crew from Tomoka Brewing Company did a fantastic job making sure the food continued to stay stocked and no one spent too long without a drink in their hand. Thanks, as always to our sponsors—the Palm Coast Business Assistance Center, Volusia/Flagler SCORE, Flagler County Department of Economic Development and Beach FM/WNZF—your support of local businesses and businesspeople is noted and much appreciated. This was a special night for entrepreneurs, as it kicked off a week of events hosted by Office Divvy and featuring Rob Thomas, a national networking guru. Hear more about Rob Thomas USA and Networking in Diners, in Rob’s SoapBox video. Rob came down from Connecticut in a special partnership between Office Divvy and Peralta Design. Here is Ramon Peralta—no stranger to Entrepreneur Night—on how Peralta Design helps companies stand out. The Entrepreneur SoapBox was Busy! Rob and Ramon weren’t our only guests up on the Entrepreneur SoapBox. Thirteen total SoapBox videos were shot for one of our busiest nights ever! Enjoy learning more about some of these awesome Entrepreneurs in these videos below. First, Tyler LeCompte of Net Works shares a little bit about his work with 1 Million Cups, the Daytona Beach edition of an event that runs weekly in dozens of communities—envisioned and rolled out by Kauffman Foundation. In this SoapBox video, attorney Art Zimmet tells us a little about his work with Pizzamico, an interesting startup built to help independent restaurants implement online ordering without upfront fees. We can’t embed all of the videos here, but don’t worry. If you’re looking for yourself or someone specific, you can find those videos on our social media pages (Twitter and Facebook). We’ll make sure to share them all! We shoot these SoapBox videos to help attendees tell the world a little more about themselves. More than that, however, we enjoy the opportunity to learn a little bit more about them ourselves! Many a great conversation has been kicked off thanks to something overheard on the now-famous SoapBox. Next time you’re out at Entrepreneur Night, step on up and have something interesting to say! Entrepreneurs themselves, Jen Hawkins and Pete Szunyogh opened their nano-brewpub first in Ormond Beach. They immediately gained recognition by garnering multiple honors in the Best Florida Beer Championship. Since that initial success, they have partnered with Rich and Mike McCarthy to open this second, larger brewery in Port Orange.